Being time-served afternoon tea aficionados, we do love something new and different when it comes to passing an afternoon partaking of the old tea and cakes. 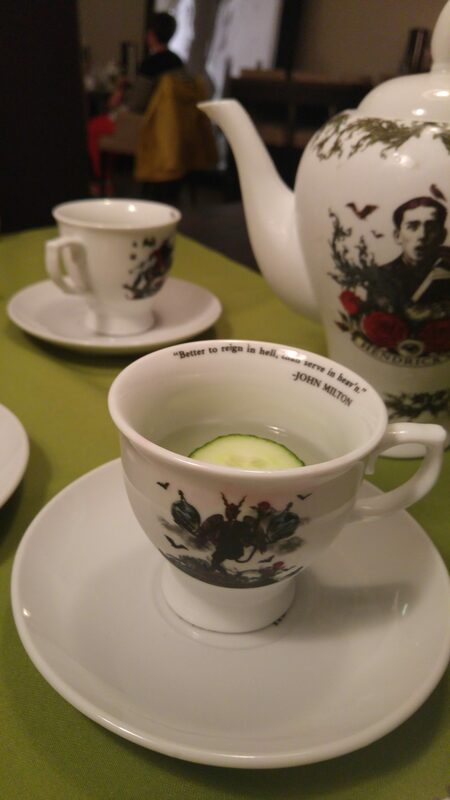 This summer we pushed the boundaries a little bit further by trying the Hendricks ‘G&Tea’ at the Park Plaza Hotel in central Cardiff. None of those Assam vs Darjeeling vs Lapsang Souchon vs English Breakfast discussions here. Instead the teapot contained an absolutely delicious Hendricks Elderflower Collins cocktail composed of Hendricks Gin, Elderflower Liqueur, Maraschino Liqueur, Lemon Juice and Soda. It’s all served in a big china teapot with traditional china tea cups. We tried it, at the suggestion of our host, with a few slices of cucumber and it made it even more interesting and tasty. There was the usual selection of freshly prepared finger sandwiches and cakes and warm scones with jam and clotted cream. It was all very tasty and the accompanying gin gave it all a special little buzz for the afternoon. It’s a really great variation on an old favourite. The Laguna Bar in the Park Plaza is a perfect setting for the G&Tea, with a cosy, but not subdued atmosphere. Seating is in a combination of open tables and partly enclosed booths. It offers a lovely intimacy but without being isolated or shut-off from the ‘buzz’ of the room. The service was impeccable, with some really good information given about the different types of gin around and the history of Hendricks gin. It was a really enjoyable afternoon with plenty of delicious food and drink. 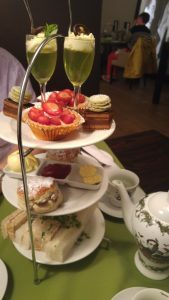 At £21.95 per person it’s a great way to spend a lazy afternoon indulging in a special afternoon tea treat with an alcoholic twist. You can get all the information you need on the Laguna Bar’s selection of afternoon teas here.